For companies that have small, large or multiple locations, minimal supervision leaves opportunity for time theft and buddy punching. 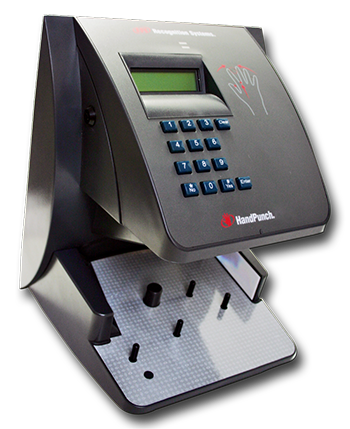 The Scout Hand Geometry reader brings the flexibility of a full function time and attendance terminal together with the sophistication of the most accurate identification technology available. Using field-proven biometric technology, the Scout Hand Geometry reader uses the size and shape of the user’s hand to verify their identity each time they use the terminal. This practical and precise solution makes card-based systems obsolete. The hand reader is very durable and capable of withstanding the worst conditions. Enclosures for cold, wet and dry environments are available. We have been in business with the manufacturer of the Hand Punch system for the better part of a decade. During which time we have experienced nothing less than the highest degree of professionalism. Schlage is a division of Ingersoll Rand, a leader in industrial technologies. With over 100 years of experience Ingersoll Rand and Schlage provides both public and private sectors with the tools needed to turn work into progress. The user friendly menus make the Scout very easy to use. From the menu, users are able to quickly choose activities they want to complete. The user can transfer departments, enter tips, etc. The menu walks the user through the entire process. The reader is equipped with an infrared camera that takes a three dimensional image of the user’s hand each and every time the user accesses the terminal. The image of the user’s hand is then compared to the previous hand scan and based on a computer algorithm, the machine determines whether or not the hands are the same. The ability to compare scans from day to day compensates for any weight gain or loss that occurs over a period of time. The Scout is among the most versatile clocks available on the market today. With over 150,000 units sold to small businesses, government agencies, and corporations in the United States and the world, the Scout is quickly becoming the most implemented clock since the launch of the manual punch clock. The sleek and user friendly design is easy for almost anyone to operate and the structural design allows the reader to reside in multitudes of environments and industries.